Goodbye too soon, sweet Griswold. We're sorry to report Griswold died late last night of rapid onset bloat. Griswold was the sweetest guy in the world with a very sad background. His original human developed serious mental issues and repeatedly threatened and attempted to kill him. In August, for Griswold's own safety, family brought him to a county shelter who contacted us to rescue. Griswold thrived at SaveABunny, living in the condo nearest the computer desk where volunteers could see and talk with him and he quickly became a favorite. His bravery and sweetness will be remembered. Bloat is an extremely serious, painful condition where it's very important to take your bunny to the vet *right away. * It's often mistaken for stasis but the two conditions are very different. Bloat happens when, for unknown reasons, the stomach fills up with gas making a bunny's stomach feel distended and quite hard, like a beach ball. A bunny can be eating and pooping fine, then rapidly crash. Stasis can occur with a gradual reduction in poops and a slowdown of appetite over time. 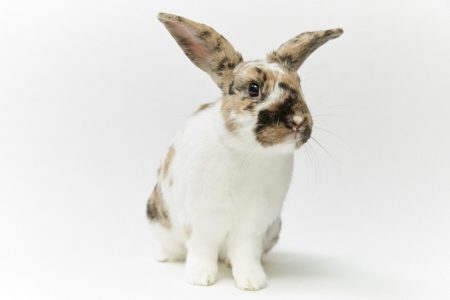 However, the difference in symptoms between bloat and stasis once a bunny is showing distress can be very subtle and we urge you to take your bunny to the vet.